Mongolia’s rapid transition to democracy and an increasingly free market economy have been accompanied by rapid growth of urban centers, ambiguous land rights, halting efforts at privatization of land, and confusion over governance of pastureland. Increasing inequality between rural and urban populations, growing gender gaps, and persistent poverty are all concerns. Mongolia’s extensive but ecologically fragile grasslands support half of the country’s working population. Over a fifth (21%) of Mongolia’s GDP is produced by herders, but most of the country’s pastureland is overgrazed and overstocked. In spite of its progressive legal framework for natural resource protection, Mongolia’s institutional capacity for enforcement is weak. As a result, irrigation on arable land has decreased, water quality in rural areas is poor, and illegal logging is rampant. The mining sector is growing rapidly, with licenses for mining and mineral exploration covering 43% of Mongolia’s territory. At the same time, the growth of mining is responsible for an increasing number of conflicts over land and water resources, water pollution, and land degradation. While the enactment of the 2002 Land Law clarified some aspects of the legal framework governing land, it did not reach pastureland rights, which continue to be ambiguous and poorly implemented. A law governing pastureland issues is currently before the parliament for consideration, however. Donors could use their expertise to assist the Government of Mongolia (GOM) in reviewing all components of the legal framework on pastureland rights, identifying gaps, and providing technical assistance in the drafting of legislation and regulation, as needed. In the forestry and mining sectors, training programs for environmental inspectors are needed, and better access to resources for field staff would improve their ability to reduce illegal forest harvesting and environmentally unsustainable mining practices. Donors could assist the GOM by providing capacity-building to local government officials and helping develop public-awareness campaigns with strong legal literacy components to advise officials and the general population on issues of land and other natural-resource rights and the legal framework governing those rights. Particular emphasis could be placed on institutions responsible for regulating pasture use and possession rights. Despite the legal requirement for joint titling of land, the vast majority of land in Mongolia is held by men. The Mongolian Women’s NGOs Coalition and its constituent groups have worked to develop women’s political base and enforce gender quotas in representative bodies. Donors could support these groups and help them to extend their influence to issues involving rights to land and other natural resources. Legal literacy programs and legal aid services could be used to reach women in remote and isolated areas, advise them of their rights to land and other natural resources and support their ability to assert and enforce their rights effectively. In addition, the Kazakh minority, largely residing in western Mongolia, is increasingly vulnerable to exclusion from political discourse due to pan-Mongolianism and Khalkha (ethnic Mongols) hegemony. Legal literacy and legal aid programs could be designed to reach these groups. USAID has assisted the GOM in the area of general judicial reform and capacity-building. Those efforts could be expanded and extended to reach tribunals governing land and natural resource rights, including courts, governors, and khot ails (nomadic camps generally comprised of between two and seven multigenerational households). USAID and other donors could assist in the development of appropriate mechanisms and procedures for dispute resolution, particularly in contentious areas of competing rights to pastureland, water, and forest products. Many commentators note the potential of community-based pasture management programs, several of which have been piloted in Mongolia by a variety of donors over the last decade. These programs could be evaluated, and best practices and lessons learned collected as a first step toward developing a model program or programs based on community-level decision-making that could be rolled out and adapted in the various regions of the country. Forty percent of the population in Mongolia lacks access to safe drinking water. In rural areas, only 17% of the drinking water consumed meets health standards. Privatization efforts have resulted in insufficient service provision and payment systems skewed toward wealthier users. Donors could support projects aimed at improving water quality in rural areas (and augment their support for current projects underway in urban areas), and could work with the GOM to ensure that privatization measures result in adequate service provision, at affordable prices, to the poor. Little reliable information is available on the present state of Mongolia’s forests, although estimates indicate that the current harvest of forest resources is over double the sustainable amount. Donors could support efforts to assess and monitor the status of forest resources in Mongolia, which could be used to inform and augment efforts to bolster administrative capacity in the forestry sector. Over the last two decades, Mongolia has undergone a rapid transition from a centrally planned, highly subsidized economy to a democracy with an increasingly free market. The attendant social upheaval and rapid economic growth have resulted in burgeoning urban centers, ambiguous land rights, halting efforts at privatization of land, and confusion over governance of the country’s critical pastureland. Inequality in asset holdings (particularly livestock) is increasing, and gender gaps in political, economic, and social spheres expanding. Thirty-six percent of the population lives below the national poverty line. Three-fourths of Mongolia is covered by ecologically fragile grasslands that support more than 40 million head of livestock and half the country’s working population. Despite drought and harsh winters that make nomadic livestock production a risky and challenging occupation, 21% of Mongolia’s GDP is produced by herders. Seventy-five percent of pastureland is overgrazed and overstocked. Inequalities between rural and urban populations are increasing. Rural residents have less access to education, health care, safe drinking water, information, basic services, and income-generating activities. Most rural residents do not have formal rights to residential, farming, or pasture land. Poverty is increasing in the rural areas; 46% percent of the rural population lives below the national poverty line. Most of Mongolia’s agricultural land is held by large companies under lease agreements. Forests, pastures, and grazing lands are owned by the state and cannot be privately owned. Urban and peri-urban land markets have been more active than rural markets. However, the sale and registration process suffers from confusion, inefficiency, and corruption. Owners of private land who try to register title are shuffled between administrative agencies where there is no clear delineation of responsibility. Land administration offices lack staff capacity. Residential land privatization has resulted in multiple allocations of some land, and related disputes over rights. The 1992 Constitution guarantees equal rights for men and women, and Mongolian legislation provides for women’s equal rights in inheritance, land use, and ownership of livestock and other property. However, women’s land tenure and property rights are compromised by the absence of clear legislation around property rights in the contexts of divorce and inheritance. Mongolia has a progressive legal framework for natural resource protection, but institutional capacity for enforcement is weak. Access to safe drinking water in both urban and rural areas remains a significant challenge, and illegal logging is rampant in the country’s forests. Mineral resources, relatively unexploited until recently, have begun to infuse Mongolia with funds for infrastructure-development and comprise an increasing percentage of Mongolia’s GDP. Licenses for mining and mining exploration cover 43% of Mongolia’s territory, and mining is responsible for an increasing number of conflicts over land and water resources, water pollution, and land degradation. Mongolia is a landlocked, mountainous country with a total land area of 156 million hectares. Most of Mongolia is pastureland (126 million hectares), followed by arable land (about 1 million hectares) and urban areas. Mongolia’s pastures comprise the world’s largest contiguous area of common grazing land. Around 27% of pastureland can be classified as forest/mountain steppe, 30% as dry steppe grassland, and the remaining is Gobi desert steppe and desert. Only 7% of the cropland in Mongolia is irrigated, and 6.5% is forested. The average rate of deforestation in the 2000–2005 time period was 0.5% (World Bank 2009a; World Bank 2003; FAO 2008). Mongolia’s 2008 population was estimated at 2.6 million people, making Mongolia one of the least densely populated countries in the world. Approximately half of the population lives in the capital, Ulaanbaatar. Of the 43% of the population that is rural, two-thirds is engaged in livestock herding. 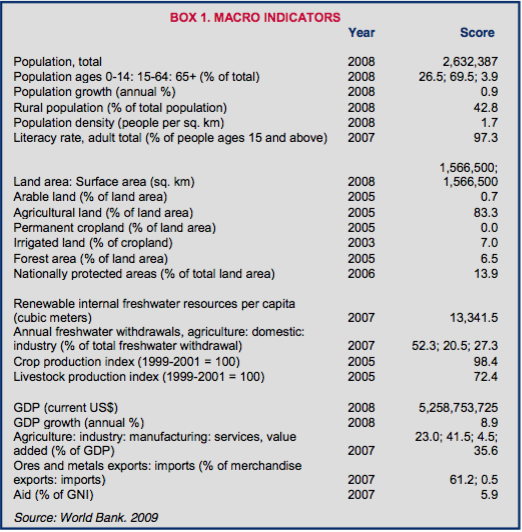 The country’s total 2008 GDP was US $5.2 billion, with 23% from the agricultural sector. Industry and services were 41% and 36% of GDP, respectively. Thirty-six percent of the population is poor (46% of the rural population and 27% of the urban population) (World Bank 2009a; World Bank 2004; Hanstad and Duncan 2001; IMF 2005; UNICEF 2009). Overgrazing, overstocking, climate changes, and other pressures are causing the degeneration of Mongolia’s pasturelands. First, over the past two decades, herders have allowed livestock to overgraze pastures near to villages and undergraze pastures in remote areas. In the past, livestock grazing was carried out in a semi-nomadic manner with frequent changes in pasture allowing regeneration to occur. Today, permanent grazing is often practiced in the vicinity of villages and artificial wells constructed during the Soviet era. Herds are concentrated in pastures near villages and exceed the safe carrying-capacity of the land. In particular, overstocking of livestock such as goats has lead to a 33% decline of plant species supplying forage over the past few decades. Second, Mongolia is afflicted with a cold, harsh climate and short growing season, and experiences frequent droughts and occasional severe winters, known as dzuds. Dzud refers to a range of winter weather-related conditions that include heavy accumulations of snow or ice crusts covering pastures (which prevent grazing), or the absence of snow or ice at winter pastures (which prevents livestock from accessing pasture or from receiving adequate hay, fodder and water). Mongolia has experienced severe dzuds in the past decade. In 2010 alone, approximately 3% of the country’s roughly 44 million livestock were lost and many more losses are expected. Some herders have lost 50–70% of their livestock. Third, low regeneration rates for Mongolia’s pasturelands amplify the impacts of overgrazing, overstocking and weather-related losses. Primary causes for slowing regeneration rates are that herding households are increasingly less mobile, and the traditional, sustainable practices of transhumance, or seasonal pasture rotation, are becoming less common. Other factors contributing to pastureland degradation include: an increase in private livestock holdings; the reduction of pasture areas due to desertification and soil erosion; and pasture allocation for agricultural cultivation, construction, and development of mineral resources (UNICEF 2009; Mearns 2004; World Bank 2009b; World Bank 2004; World Bank 2003; World Bank 2010; ANGOC and ILC 2006; Suttie 2000). Prior to the establishment of Soviet rule, Mongolian society was nomadic, consisting primarily of nomadic herders of horses, camels, cattle, sheep and goats. Moving from place to place, herds were given sufficient time to utilize the range resource, and moved on when the forage was consumed. Generally, as the range resource closest to their winter ger location decreased, herders moved in larger and larger concentric circles, finding the ungrazed rangelands. Pasture allocation and use were governed by the regulations of ruling nobles or customary law among herders (Fernandez-Gimenez 2006). 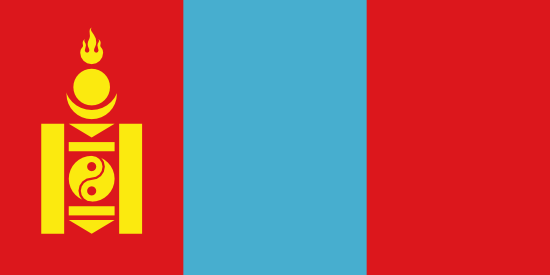 Under Soviet rule, Mongolia became a communist state with a centrally planned economy modeled after and supported by the Soviet Union. Land was owned by the state and was allocated by local authorities for residential, agricultural, and development purposes. Agriculture was collectivized, with groups of farms organized into a unit, managed and worked cooperatively by a group of laborers under state supervision. By the mid 1950s, herding collectives gained momentum. Collectives were segregated by species of livestock and provided shelter, food and veterinary services. Collectives allocated pasture, resolved disputes, were empowered to enter into reciprocal cross-boundary agreements, regulated land-use and seasonal movements of herds, provided transportation for moves and set aside emergency reserve pasture areas. A kind of dual formal and informal regulation of seasonal movements existed and was apparently successful in maintaining sustainable patterns of pastoral land use and distribution. For the most part, formal regulation was enforced by the state, while informal regulation was carried out within local herding communities (Fernandez-Gimenez 2006; Fratkin and Mearns 2003). In addition, population centers were developed, with facilities built at the local level. Communist regime policies included rapid urbanization and industrial growth. Individuals and private entities were prohibited by law from owning, buying, or selling land (Batbileg 2008; USDOS 2010). Following the dissolution of the Soviet Union in the 1990s, Mongolia began transitioning toward a market economy through stages of privatization. In the first stage, the Green Revolution Program allocated small plots to up to 100,000 families. These plots averaged one hectare of arable land, and were intended for cultivating vegetables for sale and household sustenance. The Government of Mongolia (GOM) distributed collectively owned herds to households, and sold state-owned enterprises and housing. Livestock was distributed largely among the higher-ranking Mongolians who had faithfully served the Russian bureaucracy, but also among the individual herders who were members of the collectives. While de-collectivization included the privatization of assets, there was often de facto continuation of the practices and structures of the collectives, meaning that the agriculture sector, including herding, continued for a time much as it had during the collective era. During this time, two significant things changed. First, the herders’ safety net disappeared as subsidies terminated. Second, herders attempted to minimize their risk by increasing herd numbers and by changing their herd structure to maximize cash-producing products such as cashmere and airag (fermented mare’s milk), since cash could now be spent in the cities. These efforts resulted in increased grazing pressure on areas near the urban centers (Hanstad and Duncan 2001; Myers and Hetz 2004; Fernandez-Giminez 2006; Batbileg 2008). In the second stage, the GOM began privatizing urban and residential land, although private ownership of land was not fully realized until 2003. The amount of total land available for privatization was between 2% and 3% of the total land area of Mongolia. Families were entitled to land if they had officially registered as a married couple or as a household unit, which includes extended family. Many families who applied were low-income and based in peri-urban areas, often living in gers (traditional yurts). The size of the land parcels varied, with the smallest parcels being granted in large urban areas, and larger parcels being granted in aimag (administrative district) and soum (rural district) areas (ADB 2008b; Batbileg 2008; Myers and Hetz 2004). Because the Government was preoccupied with the transition process from a centrally planned to a market-based economy, the development and management of its urban sector was not initially accorded priority. One of the major urban issues facing Mongolia is the increase in nomadic populations moving into urban centers in ger districts, particularly Ulaanbaatar. The population in Ulaanbaatar accounts for the majority of this urban population, and is estimated at approximately one million (38% of the total population and 63% of the urban population). The urban population in the rest of Mongolia resides in medium to small-sized aimag centers (provincial towns).The capital has been unable to cope with rapid population growth in terms of city planning, provision of services, and protection of the environment and, as a result, park spaces, functioning roadways, and infrastructure maintenance have deteriorated over the past decades. By the end of 2006, more than 1.5 million persons (roughly 61% of the total population of 2.6 million) were living in urban areas in Mongolia (ADB 2008b). As of June 2008, 7% of Mongolia’s population held privatized land. At that time, the total land privatized to Mongolians free of charge represented less than 1% of the entire territory, with most active privatization occurring in urban areas. Numbers have significantly increased since, especially in urban areas. According to unpublished data from the Mongolian Administration of Land Affairs, Construction, Geodesy and Cartography in 2010, approximately two-thirds of the residential land plots in Ulaanbaatar have been privatized, along with about 90% of such plots in cities elsewhere in Mongolia. In rural areas, although there are no legal restrictions of private ownership on cultivated agricultural land, only 1% of total land area fell under this land-use category in 2008. Some commentators speculate that either rural residents have not considered land privatization to be valuable, or that information about land titling was not widely disseminated in rural areas (Myers and Hetz 2004; ADB and World Bank 2005; ANGOC and ILC 2006; Batbileg 2008). During its transition to capitalism and democracy the early 1990s, Mongolia established a new legal framework into which property law was incorporated. The 1992 Constitution provides for the rights of fair acquisition, possession, and inheritance of movable and immovable property. The GOM retains the right of eminent domain, prohibits ownership of land by foreign citizens, and expressly forbids ownership of pastureland. The Constitution also establishes the right of Mongolian citizens to live in a safe and healthy environment and states that all land and natural resources of Mongolia are subject to state protection with the adoption of environmental laws in conformity with the Constitution (GOM Constitution 1992; Myers and Hetz 2004; World Bank 2003). The Land Law of 1994 was the first legislation to regulate possession, use, and protection of land. It also established land dispute resolution procedures, and defined lease and use rights to state-owned land for citizens and foreigners. Resolution 143 (1995) gave local aimag and soum-levelgovernments primary responsibility for implementation of the Land Law. The 1994 Land Law also regulated the use and protection of pasturelands, and contains provisions for leasing of campsites and pasture (GOM Land Law 1994; Hanstad and Duncan 2001; Fernandez-Gimenez and Batbuyan 2004; Myers and Hetz 2003; GOM Land Law 1994). Following the 1994 Land Law, there have been a number of laws adopted and relevant regulations and resolutions issued to promote privatization of land. The Civil Code of 1994 governs the creation, termination, and transfer of property rights, including provisions for contract and inheritance of property rights. A 1996 amendment allows for mortgage of immovable property (land). Other laws include the Law on Cadastral Survey and Land Cadastre (1999) (GOM Civil Code 1994). The Land Law of 2002 and the Law on Mongolian Citizens’ Ownership of Land of 2002, enacted in 2003, amended the Land Law of 1994. The Land Law of 2002 holds several provisions aimed at clarifying rights and preserving pastures. For example, the law: (1) eliminates the shorter lease-terms previously required for farming land; (2) allows long-term licenses for possession of urban and peri-urban land, household plots, herder camps, and arable land to be transferred through sale or auction or used as collateral; (3) prevents grazing on winter and spring pastures during summer and fall; and (4) provides for the imposition of sanctions in cases of out-of-season trespassing. Pastureland continues to be the property of the state (Myers and Hetz 2004; World Bank 2003; Batbileg 2008). The Law on Mongolian Citizens’ Ownership of Land, adopted in 2002, regulates the allocation of land for ownership, the types and sizes of land that can be owned, and outlines the responsibilities of local administrations (World Bank 2003; Myers and Hetz 2004; Mearns 2004). In regard to natural resource protection, the basic guidelines for the protection of the environment and its natural resources are formulated in directives such as the Mongolian National Security Policy Orientation of 1995, the National Development Strategy of 1996 and the Ecological Policy Orientation of Mongolian State of 1997. Legislation passed in 1995 and 1996– including the Law on Natural Plants and the Law on Fees for the Harvest of Forest Timber and Fuelwood, as well as over 30 regulations and resolutions to support those laws– furthered the objectives outlined in the broader directives (Damdin and Bolormaa 2002: ILEIA 2010). Mongolia has designated over eighteen million hectares of land (11.67% of the national territory) as Special Protected Areas and plans to increase the amount of protected land to 30% of the country’s territory by 2030. Primary legislation governing Special Protected Areas in Mongolia includes the Law on Land (1994), Resolution No. 143 (1995) (Appendix 5 on the Procedure on the Taking Away of Land for Special Needs), the Law on Special Protected Areas (1995), and the Law on Buffer Zones (1997) (Hanstad and Duncan 2001). While the country is rich in customary laws and norms, these are not considered to be a principal source of official law. The exception is in regard to pastureland, where dynamic and adaptive customary law and traditional practice combine with formal law to govern use. Before the communist revolution in 1921, pasture allocation and use were governed in many areas by a combination of formal rulings issued by ruling nobles, secular princes and important lamas in the Tibetan Buddhist church, as well as informal norms and customs. During the Soviet era these practices continued. However, land was allocated to each collective, and pastoral households made use of recognized areas of pasture that were owned by the state. The state provided resources to support herding collectives. With the dismantling of herding collectives in Mongolia in 1992, formal regulatory institutions for allocating pasture vanished, and weakened customary institutions were unable to effectively fill the void. Recent legislation has sought to legally underpin solutions to problems related to pasturelands through co-management at the local level. The Environmental Protection Law of 2005 and the Forestry Law of 2007 allow for decision- making that involves land users, herders, NGOs and other stakeholders (Fernandez-Gimenez 2006; ILEIA 2010). Most recent legislation has sought to address the neglect of urban areas. Legislation includes the Sanitation Law (1998), Housing Law (1999), Housing Privatization Law (1999), National Housing Strategy (1999), Condominium Law (1999), Energy Law (2001), Water Supply and Sewerage Treatment Law (2002), and the Regionalized Development Management and Coordination Law (2003). An important step in the development of urban utilities has been the Water and Mineral Water Use Fees Law (2004) and the 2004 Mongolia Water Law. The latter establishes a new Water Agency and calls for the semi-privatization of the publicly owned water infrastructure (ADB 2008c). The Mongolian Constitution and subsequent land laws recognize Mongolian citizens’ rights to private land ownership. Whereas earlier legislation only allowed families to be eligible for private land ownership, individuals are currently eligible as well. Forests, pastures, and grazing lands are owned by the state and cannot be privately owned. Entities owned by Mongolians may also own land but foreign individuals and entities may not (GOM Constitution 1992; Batbileg 2008). Land ownership. Ownership rights are limited to Mongolian citizens and include the right to manage and sell the land. As of November 2004, forestland, pastureland, water basins, and special needs/protected areas could not be owned. Mongolian citizens can own plots of land for family residential‖ and/or commercial purposes, and privatization of cropland is expected in the near future. Land possession. Licenses for possession of land are granted to Mongolian citizens for periods of 15–60 years with an option to renew for up to 40 years. The right of possession includes the right to manage the land. A right of possession can be transferred by inheritance or by consent of the legal body that originally granted the possession rights, but cannot be sold. Land use. A right of land use provides for the right to make use of a particular land feature, with no right to alienate the land. Land-use contracts are granted for terms of five years with one extension. Foreign entities can obtain use-rights but cannot use the land for agriculture or livestock (GOM Land Law 2002; Myers and Hetz 2004; Fernandez-Gimenez and Batbuyan 2004). The Land Law of 1994 empowers soum governments to grant formal land-possession rights to herder households for seasonal campsites and pastures. As of 2004, only campsites had been allocated to herders. There were no official plans to allocate pastures to individual households or groups of herders. Other open-access lands subject to government regulation include wells, public-tenure lands in cities, villages and other urban settlements, lands with forest resources, and lands with water resources (GOM Land Law 2002; Mearns 2004; Fernandez-Gimenez and Batbuyan 2004; World Bank 2003). Pastureland is owned by the state and operated under a common tenure system. Common tenure land – also referred to as ‘common use land’, ‘common use’, and land that is ‘commonly used’ – is undefined by the law, but refers to undivided land that is available for joint use by residents of the community in which it is located (Myers and Hetz 2004). Private ownership of land was not possible until 2003, when a government program was implemented that allowed family possessors of residential land to acquire title to the land at no cost. Private land ownership rights are established for residential land and, according to the Mongolian Administration of Land Affairs, Construction, Geodesy and Cartography, the majority of urban households in the country now own their residential plots, but the extent of these rights has not been tested by time or courts (Batbileg 2008; Myers and Hetz 2004). Acquiring a fully marketable title requires that a plot first be privatized, and then registered. The land registration process in Mongolia reportedly requires five steps, an average of 11 days, and costs approximately 2% of the overall value of the property. In practice, however, the process suffers from confusion, inefficiency, and corruption. Land administration offices lack staff capacity, and owners of private land who try to register title are often shuffled between administrative agencies where there is no clear delineation of responsibility. Despite these impediments, a substantial number of titles (65-70% nationwide) were successfully registered by 2010, according to unpublished information from the Mongolian General Authority on State Registration (Batbileg 2008; Myers and Hetz 2004; Wehrmann 2008; World Bank 2009c). Individuals who have licenses for possession of land within zones defined as urban have the right to purchase the land from the state. However, the extent to which such licensees are aware of the right is unknown, as is the extent to which the right has been exercised (Myers and Hetz 2004). With regard to use-rights, because soum (sub regions) and bag (the smallest administrative and territorial unit, similar to a municipality) governors have authority to regulate pasture-use and allocate property, the allocation process for campsites differs from soum to soum. A study conducted in Jinst soum found that 60-year contracts to campsites were granted based on the following criteria: the herder was born at the site; the herder inherited the site from his or her parents; and the herder used the site during the negdel (collective) period. In situations where two families claimed one campsite, the contract was granted to the household with the longest residence. In Bayan Ovoo soum, contracts were granted based on length and continuity of past use at the campsite, customary hereditary rights to the site, use of the site during the negdel period, and development of a new campsite on currently unoccupied land (Fernandez-Gimenez and Batbuyan 2004). The 1992 Constitution guarantees equal rights for men and women, and Mongolian Civil and Family Laws provide for women’s equal rights in inheritance, land use, and ownership of livestock and other property. In general, women in Mongolia enjoy relative equality. Their education, employment, and health indicators are almost equal to those of men. However, the participation of women in the political sphere has fallen dramatically since 1990, the rate of divorce is 21%, and the number of registered marriages is declining (GOM Constitution 1992; Tuya 2000; EBRD 2009; UNICEF 2009). Property registration efforts have revealed a bias towards male land-ownership. The divestment of assets through vouchers and cash auctions has primarily benefited men. Mandatory joint registration of land has ensured that some women are able to benefit from the land they possess; however, women’s land tenure and property rights are compromised by the lack of inheritance and divorce legislation acknowledging their newly created ownership rights. The approximately 175,000 Mongolian women who are unmarried and living outside of a registered family are excluded from land ownership. Although joint titling for all members of the household is required by law, the requirement can be waived and, in the first wave of privatization, 46% of the rural property was titled only in the name of the male head of household (World Bank 2003; ADB and World Bank 2005; Burn and Oidov 2001; Mearns 1993). Women-headed households with no permanent male partner – common in some regions – are particularly vulnerable to poverty and tenure insecurity. Single women herders tend to receive less than their entitled distribution of assets, and the property and herds that they do receive are more likely to be small and of poor quality. As a result, women are often the poorest of the rural poor (Burn and Oidov 2001; Mearns 1993; Tuya 2000). Under the Ministry of Roads, Transport, Construction and Urban Development (MRTCUD), the Administration of Land Affairs, Construction, Geodesy, and Cartography (ALACGaC) was established in 2003. It is responsible for land management, geodesy and cartography. Property registration is managed by the General Authority on State Registration (GASR), which is separate from MRTCUD (Myers and Hetz 2004; Batbileg 2008; Batbileg 2008b). The smallest administrative levels (bag, soum and aimag) have roles in both land management and implementation of legislation. However, in some localities those roles remain unfulfilled because of limited capacity and lack of regulations (Myers and Hetz 2004; Fernandez-Gimenez 2006; Hanstad and Duncan 2001). Mongolia’s formal land market has not yet matured, perhaps in large part due to the yet incomplete privatization and registration processes. Although the government has recently privatized and registered a significant number of land plots according to the GASR, many plots remain to be privatized, especially in rural areas, and registration lags behind privatization. Until titles are registered, they cannot be formally bought or sold (Batbileg 2008b). The growth of the mining sector has brought foreign investment, contributing to an increasing urban population and an increased demand for improved housing stock. While the shortage of quality housing is clearly getting worse (particularly in the capital) no reliable data exists regarding trends in urban land values and markets. An informal residential land market has developed in urban areas, although the volume of transactions is currently unknown (Myers and Hetz 2004; Batbileg 2008). Only individual Mongolian citizens can own real estate. No corporate entity of any type, either foreign or domestic, may possess ownership rights to land. They may own structures outright, however, and can lease property for terms ranging between three and 90 years (US Embassy 2010). Credit markets to support land transactions have been slowly emerging. A 1996 Civil Code amendment allows for mortgage of immovable property and includes land when it is transferred to private ownership. Mongolia’s mortgage market was valued at over US $5 million in 2007. As of 2004, commercial loan institutions would not accept land titles as collateral for mortgages without donor subsidy, but would mortgage buildings. Procedures, costs and valuation vary greatly in this nascent market, but Mongolian banks now offer long-term mortgages to Mongolian citizens in the middle and upper classes, which is seen as a major step forward for the real estate market (Harlow 2007; Myers and Hetz 2004; GTZ 2006). The Mongolian government can claim land or restrict use-rights in the national interest. Currently, this means little, as most land outside Mongolia’s few urban centers remains government property, as provided in Mongolia’s constitution. Local governments are given the power to appropriate land under state special protection, and the central government possesses the rights to acquire land under possession of citizens, entities, and organizations for special need (Myers and Hetz 2004). When a state agency determines that public need requires exclusive use of particular private property, due compensation and payment must be tendered to the owner. The process requires the relevant authority to submit to the Cabinet an agreement between the authority and the landowner. Upon approval, the local governor will contract with the landowner to vacate the land; residential landowners can only be displaced between May 15th and September 15th of any year. The state must pay the compensation within 60 days of signing the agreement. Disputes regarding land-takings are decided by the court (GOM Constitution 1992; GOM Land Law 2002). Land disputes and conflicts are present in both Mongolia’s rural and urban areas. Traditionally, herding groups followed customary pasture-use patterns that were considered unwritten law. Since the 1990s, khot ails (herding camps consisting of groups of households) have acted as a forum for the coordination of common seasonal pasture use. Multiple khot ails form communities or neighborhood groups that have lived closely together for generations. The neighborhood group has an acknowledged leader who plays an important role in the settlement of disputes over land and resources (Myers and Hetz 2004; Fernandez-Gimenez 2004; Fratkin and Mearns 2003; Mearns 2004). Disputes over rights to winter grazing areas are common and have, at times, resulted in violence. Areas of potential future conflict include competing claims to water and pasture use, agricultural land distribution, the expansion of protected areas to further include customary grazing areas, and conflict over property rights in areas undergoing mining exploration and mineral extraction (Myers and Hetz 2004). Despite a generally successful privatization process in Mongolia, residential land privatization in urban and peri-urban areas has sometimes resulted in multiple allocations of land, and disputes over land rights have ensued. Additionally, unclear zoning, access and demarcation have led to disputes, mainly in the ger district of Ulaanbaatar. In Ulaanbaatar, the Technical Committee of the Municipal Land Office is charged with resolving land disputes. From 2004–2008, this committee resolved 8180 petitions for land-use and possession issues (Wehrmann 2008; Suttie 2000; Soyolkhuu 2009). Possession or use disputes between a state agency and a private individual or entity are settled by the governor of the higher level. Possession or use disputes between private individuals and entities are settled by the local governor. Issues regarding private property ownership are settled by the courts (GOM Land Law 2002). The privatization of land has been the primary land-related issue in Mongolia this decade. The reorganization and recognition of land property-rights is still in early stages, and the intended consequences of private ownership (increased investment and mobility of capital) have yet to be realized (Batbileg 2008). In rural areas, the Mongolian government has not yet undertaken a review and reformation of pastureland rights and management. Approximately half of Mongolia’s workforce relies to some extent on herding and pastureland for their livelihoods. Pastureland remains ecologically fragile and 75% is degraded to some degree as a result of overgrazing and overstocking and the growth of the mining sector (ANGOC and ILC 2006; UNICEF 2009). Because of the threat of land degradation brought about by overgrazing, depletion of forest resources by legal and illegal logging, excessive use of water resources, and mining, the GOM has developed policies to regulate forest resource use and enable decentralization of management through forest user groups. The government continues to utilize and enhance community-based natural resources management (CBNRM) as its new approach (GOM 2010). In urban areas, the provision of urban infrastructure and services is currently poor and is not keeping pace with population growth. Many basic services are either inadequate or absent. Insufficient and unreliable urban services add to business and household costs, damage the urban environment, and diminish quality of life. The GOM is currently engaging in a cost-sharing project with donors to engage in a variety of urban development initiatives. These include infrastructure-services reforms, institutional development, and capacity-building to strengthen urban planning and policy making, and project management and project performance monitoring. With reforms underway and capacity increased, funding will be available for infrastructure improvements such as developing and enhancing water and other sanitation services (ADB 2010). USAID’s investments in improved governance in Mongolia support training and technical assistance to improve the judiciary and to support an Independent Authority in identifying and pursuing corruption cases in the public and private sectors. USAID also supports civil society organizations in engaging the public to fight corruption (USAID 2008). The recently closed Gobi Initiative was a two-phased, 10-year rural development program financed by USAID to assist the people of the Gobi region to undertake measures to develop and sustain market-led economic growth and development. Phase I was a five-year (January 1999–January 2004) program with objectives to: increase productivity and profitability of businesses; increase market value of selected animal-production; promote alternative livestock production; improve maintenance and use of Mongolia’s land and water resources; and improve access to and use of market/business information. Phase II of the Gobi Initiative (January 2004–January 2009) sought to increase the number of new and strengthened Gobi businesses and to increase the availability, access to, and use of business information by Gobi entrepreneurs. USAID’s Mongolia Agribusiness Service Project, which continues into 2011, follows the work of the Gobi Initiative to enhance market-driven, sustainable agribusiness development in Mongolia, but does not focus on land or water resources (USAID 2003; USAID 2009; USAID 2010). The Asian Development Bank (ADB)’s Environmentally Sustainable Rural Development Project began work in 2009 to combine environmental outreach with sustainable agriculture and pastoralism. The project mapped land parcels available for privatization, and is also developing a land information system to which the State Registry will supply information. The ADB has also been active in Mongolia’s urban sector since 1992. GTZ’s cadastre/land management program continues to support the Administration of Land Affairs, Geodesy and Cartography (ADB 2007; GTZ 2009). The World Bank started the second phase of a three-phase sustainable livelihoods project in 2007 to support herders in preparing for risks. The project is $33 million dollars and closes in 2012 (World Bank 2007b). The Swiss Agency for Development and Cooperation started the Green Gold initiative in 2002 to promote sustainable grassland management. This project supported co-management of pasture resources by herder communities, and tested new technologies for improvement of degraded grasslands. The first phase ended in 2008 and the second ended in 2009. The total budget for both phases was CHF 6.2 million (Swiss Agency for Development and Cooperation n.d.). In 2008, the Millennium Challenge Corporation (MCC) entered into a 5-year (2008–2013) US $285 million Compact with the GOM. One of the four projects designed to reduce poverty and provide for sustainable economic growth is focused on the registration of property titles to land. The MCC Property Rights Project aims to: implement a scheme for leasing pastureland in the peri-urban areas around Ulaanbaatar and other cities; assist in privatization of household-occupied hashaa plots (an area of land in the city, usually containing a house, with a fence around it) in Ulaanbaatar and other cities; and strengthen the State Immovable Property Registry. The long- term objectives of the projects include an increase in the security and capitalization of land assets held by lower- income Mongolians, and to increase peri-urban herder productivity and income (MCC 2008a; MCC 2008b). There are five major basins in Mongolia, including the dry Gobi Desert basin and the Shishhid basin in the wet northwest (FAO 1999). Mongolia is home to several regionally important freshwater ecosystems, including the Great Lakes Depression (Basin), the Darkhad Depression, Khovsgol Lake, and the Bulgan River Basin. The Great Lakes Depression, containing an important regional wetland, is characterized by a series of shallow and interconnected lakes. The Darkhad Depression, fed by the Shishhid River, is also composed of numerous shallow lakes. Khovsgol Lake is the second-largest freshwater lake in Asia. Fifty percent of Mongolia’s 3500 lakes are located in the Gobi region, largely in the form of small shallow and/or salty water bodies. Many of these lakes have been severely depleted due to mismanagement and overuse (Batnasan 2004; UNESCO 2006). The country’s mountainous northern and western areas are the source for large rivers. A limited number of surface streams are found in the south. The Selenge River Basin, located in Mongolia’s north, is the largest watershed in the country. The basin’s major sub-basins include the E‘Gyin, Ider, Orhon, and Tuul Rivers (UNESCO 2006). Mongolia has severe climatic conditions with long cold winters and regular droughts. The majority of the country’s annual water resources are derived from precipitation, most of which falls between June and August. Snowmelt accounts for only 15–20% of annual water resources (Batnasan 2004). Forty percent of the population lacks access to safe water resources, and only 25% has adequate access to sanitation facilities. Growing urbanization and the mining industry have significantly polluted surface and underground water resources, which has had a significant impact on associated ecosystems. Water quality is a concern in rural areas, where only 17% of water consumed meets health standards. This is due to the fact that over two-thirds of rural dwellers access water from unprotected wells or rivers. In urban areas, only 50% of households have access to adequate water services. Water quality monitoring services are generally weak, with shortages of staff, equipment and materials the national norm (World Bank 2007a). Mongolia has low water resources, but water availability is adequate due to low population and population density. In 2007, an estimated 52% of freshwater withdrawals were for agriculture, 27% for industry, and the balance (21%) were for domestic use. Groundwater is used for household and industrial use. Overconsumption of water resources in urban areas is a concern as unmetered apartment households consume four times the developed-world equivalent. Overuse of groundwater resources has led to lowering of the groundwater table, which has consequently caused some springs, lakes and their associated ecosystems to dry up (UNICEF 2009; FAO 1999; World Bank 2007a; World Bank 2009a). Almost all precipitation falls in the hot summer months, and little moisture is retained by the soil. As a result, rain-fed crop production is limited. Additionally, irrigated land has decreased in the past two decades due to high production costs and the large amounts of energy needed for crop production on irrigated land. In 1990, 5.2% of total agricultural area was irrigated; eight years later, only 2.4% of total agricultural area was irrigated. Most irrigation is from groundwater sources using overhead spraying (Ganbaatar 2004). Under the Constitution of 1992, Mongolian water resources are the property of the people of Mongolia under protection of the state (GOM Constitution 1992). Mongolia’s Water Law, enacted in 1995 and revised in 2004, regulates the protection, proper use, and restoration of water, and describes the plenary rights of state administrative organizations and their activities. Provisions on protection, restoration of water, and water-use issues such as permissions, rights, and duties of water users are also included. It also provides for integrated management of water resources. The Law requires capacity-building in the water sector, focuses on decentralization of water management, and sets penalties for violating water legislation (World Bank 2007a; GOM Water Law 2004; UNESCO 2006). The Mongolian Law on Water and Mineral Water Use Fees (1995) regulates the fee requirements for the use of water and mineral water by citizens, economic entities and organizations, and includes rules on incorporating these fees into the state budget (GOM Law on Water and Mineral Water Use Fees 1995b). Lack of financial resources, the limited number of trained personnel and weak implementation and enforcement of laws have hindered their effectiveness. Implementation and enforcement of the Water Law has been limited due to lack of institutional capacity. Additionally, some provisions of the law are vague and open to varied interpretation (UNESCO 2006). All water use in Mongolia requires a license and payment of the appropriate water services fee. Soum governors grant licenses to water consumers (i.e. citizens who will personally use the water not for profit) for drinking, household purposes, herding, and agriculture. Approval of water consumer licenses is not discretionary, but water consumers must pay a water service fee. Mongolia’s pricing policy is decentralized; local authorities are entitled to set up and revise the water tariffs. In theory, the Mongolian Government gives priority to the interests and water needs of the poor and marginalized. However, in practice small businesses pay more than large industries. Further, the rate for ger (yurt) consumers, similar to small businesses, is eighty-four times higher than for industries and mining companies. As a result, those with the lowest income pay the highest and consume the least (GOM Water Law 2004; ADB 2008c). If water is to be used for profit, the water user must sign a contract and obtain a license prior to use. Water-use contracts, citing specific purpose and per-day use, begin with a 20-year term with subsequent 5-year extensions. The Water Law requires wastewater recycling and prevention of the depletion and pollution of water resources. Use volumes of over 100 cubic meters per day must be approved by the Water Agency, use between 50 and 100 cubic meters must be approved by aimag or city department of environment, and use of less than 50 cubic meters may be approved by an environment ranger. A user’s rights may be cancelled if the user fails to meet the obligations of the contract, violates environmental protection laws, or fails to pay fees (GOM Water Law 2004). The Water Agency, which is within the jurisdiction of the Ministry of Nature and Environment, has the authority to create and implement water policy, approve larger water projects, and set environmental standards regarding use of water resources. Local governors distribute water-consumer licenses and authorize medium-sized water projects (World Bank 2007a). The Ministry of Construction and Urban Development (MCUD) is responsible for advising the government on public services and urban development. Public distribution of water is managed by urban municipalities or Public Urban Services Organizations that are subject to licensing and regulation by MCUD and interference by local governors. The Ministry of Food, Agriculture and Light Industry is responsible for irrigation development policy (World Bank 2007a; FAO 1999). Performance-monitoring and regulatory standards within Mongolia’s water management structure are weak to nonexistent (World Bank 2007a). Customary management of water rights on pastureland is coordinated through the khot ail. Water availability is an issue in the Gobi desert, desert-steppe, and eastern steppe regions, as opposed to the central and Hangai forest/mountain steppes where there are more surface-water courses. Herders assess forage quantity and water availability before moving to a new pasture. They shift to the new location based on an identifiable set of customary rules that have evolved within neighborhood groups (Mearns 2004). Recent reforms have focused on decentralization of water resource management and cost-recovery of infrastructure and services. The GOM established water companies and Public Urban Services Organizations with the intention of spurring innovation, investment and consumer-centered services. However, privatization has reduced government responsibility for the administration of water resources without giving the water companies the necessary tools or support to make changes. Additionally, instead of lowering costs, current water tariffs create a cost disparity that hurts poorer customers and subsidizes affluent customers (World Bank 2007a). In response to dwindling water resources and increasing pollution, the GOM drafted new conservation laws (1997) and declared its intention to increase the amount of land held as protected areas (UNICEF 2006). The Gobi Initiative, a USAID-funded program, sought to strengthen environmentally sustainable pasture- management through improved water management. The Gobi Initiative was recently closed and replaced by USDA’s Mongolia Agribusiness Service Projects (USAID 2003; USAID 2009). Water delivery by donor resources has generally focused on the informal and quasi-formal settlements on the outskirts of cities, called ger districts. The World Health Organization (WHO) and the United Nations International Children’s Emergency Fund (UNICEF) operate the Joint Monitoring Program (JMP) that observes the quality and use of water resource distribution. The European Investment Bank (EIB), the European Bank for Reconstruction and Development (EBRD) and the World Bank have provided long-term loans on good terms to municipal water projects. ADB’s Provincial Towns Basic Urban Services Project focuses on water purification at the soum, or rural district, level (World Bank 2007a). The latest data from the Ministry of Nature and Environment (MNE) indicates that of the total forest area of Mongolia is 19,002,200 hectares. This comprises only 8.56 % of Mongolia’s territory, making the country one of the world’s poorest in terms of forest resources. Larch and pine forests cover the north-central mountains of Mongolia, while saxaul forests are found in the southwest deserts (GOM 2010). A small population of indigenous groups and herders rely on forests for part of their livelihoods. About 200 Dukha live nomadically with reindeer in the high mountains surrounding the Darkhad Depression in Hovsgol Province. These and other nomadic herders living in forest zones depend on the forest for wood for cooking and heating. Herders may also seek out riparian forests as locations for their winter camps (Solnoi et al. 2003; Donahue 2003; Suttie 2000). A cyclical drying cycle has led to deforestation in the north of the country. Overall, fire, commercial and illegal logging, inadequate enforcement of forest rules, grazing and browsing of young trees by livestock, and insect infestations have contributed to the recent rapid deforestation (World Bank 2003; Crisp et al. 2004). Illegal logging is common and attributed to the population’s efforts to secure basic subsistence needs, enhance livelihoods, and obtain income through commercialized illegal logging. Approximately 65% of the total wood harvested is used by poor rural and urban households for cooking and residential heating. Former Soviet-era forestry sector employees often turn to illegal timber harvesting for survival because they have no other employment prospects (World Bank 2003; Crisp et al. 2004). Deforestation and heavy pastoral use have also led to the loss of ground vegetation cover. In conjunction with climate change, loss of ground cover has caused the ground to warm and melt the permafrost. Melting of permafrost dries soil, resulting in reduced plants for grazing and instability on slopes (World Bank 2003). The Constitution of 1992 declares that all forests are the property of the state. The Forest Law, enacted in 1995 and amended in 2007, banned clear-cutting and established environmental protections, strong enforcement mechanisms, and the calculation of royalties at market prices (GOM Forest Law 1995a; FAO 2007). Other relevant legislation includes the Protected Area Management Law (1994), Government Resolution No. 125 (1998), the National Forest Policy of 1998 and then revised in 2001, the Amendment to Environmental Protection Law (2005) and Nature and Environmental Minister’s Order No. 114 (2006). These policy and legal documents represented a shift in priorities from utilization of forest resources towards conservation, protection and reforestation (FAO 2008). The National Policy on Forests for 1998 to 2015 (Government Decree No. 122) was adopted in 1998, but unclear implementation approaches and lack of funding have limited its effectiveness (FAO 2007). The development of Mongolia’s legal framework, in addition to promoting protection of forest resources and biodiversity while supporting livelihoods, has sought to decentralize forest management authority to local governments. Decentralization now mandates a full range of tasks for local governments, which already lacked training, guidance and financial support. In seeking to establish other mechanisms for forest management that would lessen the burden on local governments, which were the sole owners of forests, stakeholders developed new tenure arrangements that would serve to divest management to public and private entities. As a result, the government now grants forest tenure to Special Protected Areas, private enterprises and Community Partnership Groups, as discussed below (FAO 2008). Despite an abundance of environmental and forest-related legislation to improve tenure options, inefficient enforcement, low public awareness, lack of training, and financial constraints have hindered the implementation and effectiveness of these laws (FAO 2008). As the owner of most forest land (80%), the government grants forest tenure for Special Protected Areas (SPAs) (17%), private enterprises (1%), and Community Partnership Groups (2%). The total forest area under these new tenure arrangements increased by hectare from approximately 1,500,000 to 3,320,000 for Special Protected Areas, 0 to 160,000 for private enterprises, and 40,000 to 343,000 for Community Partnership Groups between 1998 and 2007 (FAO 2008). Special Protected Areas have been established to ensure and promote biodiversity, ecotourism and traditional livelihood-supporting activities in cooperation with local government. They are established for unspecified periods, but Parliament can remove some areas from protected status to meet critical development needs, or change the protection regime. Commercial forest-harvesting is prohibited on slopes over 30 degrees, on forests less than 100 hectares in size within 50 meters of the edge of a harvesting block, and in all saxaul forests. The regulated collection of domestic fuelwood and harvesting of non-timber forest products are the only forms of exploitation permitted in these areas (World Bank 2006b; World Bank 2002). Logging companies account for most private enterprises in forest resources management. A license or contract with the state is required for the harvesting of forest resources. The license or contract must detail the reason for harvesting, the species of trees, the volume and duration of the proposed harvest, forest management interventions, technology utilized and an outline of steps to ensure forest protection and regeneration. The duration of the agreement can be 15–60 years, with a maximum extension of 40 years (FAO 2006). Community Partnership Groups are voluntary associations of local residents with the goal of forest conservation and sustainable use of forest resources. According to the Law on Environmental Protection and The Mongolian Law on Forests, these groups have the right to lease up to a maximum of 6000 hectares of forest areas for up to 60 years, with possible extension. The law also provides Community Partnership Groups with ownership rights to any forest resources they plant themselves. In exchange, the groups are responsible for providing annual reports on the status of their forest areas, enforcing relevant environmental legislation, carrying out rehabilitation and reforestation activities, and recruiting volunteer rangers and conservation managers to protect against wildfire, pest infestation, and forest degradation (FAO 2006; Ykhanbai 2005; FAO 2008). Residents of rural areas are eligible for fuelwood and timber permits; however many families collect forest products for fuelwood and construction without obtaining a permit. The urban poor, ineligible for fuelwood and timber permits, cannot afford to buy wood and, as a result, cut timber for subsistence need. Harvesting fuelwood for household use without a license is prohibited. Local communities are largely responsible for illegal harvesting, feeding demand from urban centers (World Bank 2006b; GOM Forest Law 1995a; Crisp et al. 2004). Over 300,000 hectares of forestland in Mongolia are under community forest management contracts. While generally well-received, community forest management contracts can create conflict between herders and groups of more sedentary farmers. Herders, who must move constantly to sustainably access pasture resources, do not receive benefits from community forestry and are less likely to feel an obligation to protect the forest (FAO 2006; Crisp et al. 2004). Each of the tenure arrangements described above has its own set of institutions that correspond to particular management activities. The Ministry of Nature, Environment and Tourism (MNET) handles all aspects of public forest management and national protected areas, as well as the development of national forest policy and administration of the Forest Management Center, which conducts inventories and surveys. The MNE is also responsible for nature protection, Special Protected Areas, reforestation and forestry. Forest conservation and reforestation measures are executed by aimag governments through the district, timber companies and individuals. Citizen-representative khurals (local assemblies open to public participation) are involved in the granting of licenses for forest use. Although the MNE has very limited financial capacities and the smallest budget of all government ministries, its budget has grown steadily since 1998, signaling the government’s commitment to forest management (FAO 2006). In regard to private enterprises, companies manage forested area according to their leases, which have to be renewed every year. They also incur reforestation and environmental rehabilitation expenses and must pay taxes. Prior to 2007 local governors had exclusive legal power to allocate forest resources to logging companies. Under the 2007 amendment to the Law on Forests, local representatives have the right to make decisions regarding the transfer of forest parcels to partnerships, economic entities or organizations, based on contracts. Private logging companies are subject to review by local authorities (FAO 2008). As described above, Community Partnership Groups have numerous responsibilities for their tenure rights and are weak in terms of financial capacity. The legislation to support this new forest tenure type was only created in 2007, so they have not yet been able to benefit financially from their forest leases (FAO 2008). The GOM banned log exports in 1995 and enacted an export tax on round and sawn wood in 1999. The result of these reforms was a shift from unprocessed exports to the former Soviet Union to increased processed wood- product exports and illegal log exports to Southeast Asia (FAO 2008; WWF 2002). The Gobi Initiative was a two-phased, 10-year rural development program financed by USAID to assist the people of the Gobi region to undertake measures to develop and sustain market-led economic growth and development by: increasing productivity and profitability of businesses; increasing market value of selected animal production; promoting alternative livestock production; improving maintenance and use of Mongolia’s land and water resources; and improving access to and use of market/business information. It aimed to mitigate deforestation by focusing on the causes of pasture degradation. The World Bank has taken the lead on community-based forest management programs and helped reduce deforestation in several regions. The German Agency for Technical Cooperation (GTZ) has conducted forest mapping in Mongolia. In 2002, the “Everybody Plant a Tree” campaign resulted in the planting of 449,000 trees in Mongolia (USAID 2003; USAID 2009; FAO 2007; World Bank 2004; World Bank 2006). Donors including GTZ, the United Nations Development Programme (UNDP), FAO and the Asia Foundation, have provided support to help increase public awareness of forestry policies, laws and regulations (FAO 2008; FAO 2010). Mongolia has considerable mineral resources that are largely unexplored and unexploited, and it is estimated that only about 15–25% of the country’s total area has been fully mapped to determine mineral resources, which may likely include significant deposits of uranium, gold, silver, and lead. In 2007, the mining and quarrying sector accounted for 33% of Mongolia’s GDP, 65.4% of the country’s industrial output and 75% of its export revenue. Mongolia is currently the third-ranked producer of fluorspar in the world. Other mineral deposits include gold, iron, lead, molybdenum, silver, tungsten, uranium, and zinc. Coal, gold and copper deposits could be major contributors to economic growth in Mongolia over the next decade (Tse 2009). Forty-three percent of Mongolia’s territory is under license for mining and mineral exploration mining. The largely unregulated development of the mining sector, variable commitments to environmental management, and a poor track record of environmental rehabilitation have caused the degradation of land and water resources. The illegal use of mercury and cyanide by the artisanal sector has contaminated the water and soil, and the expansion of mining enterprises is predicted to cause increased disputes with herders. It is estimated that 100,000 hectares of land have been degraded by coal and gold mining activities since 1997 (Kim 2008; Myers and Hetz 2004; UNICEF 2009). The legal and fiscal regime governing Mongolia’s mining sector is relatively progressive and transparent. The legal framework consists of the Constitution of 1992, the 1989 Law on Land and Subsoil, the 1997 Minerals Law, and the 2006 amendments to the Minerals Law (World Bank 2003; Myers and Hetz 2004; World Bank 2008). Under the Constitution, mineral resources are the property of the people under the protection of the state. The Constitution, 1989 Subsoil Law, and 1997 Minerals Law all grant the state exclusive property rights over its mineral resources (World Bank 2003; Myers and Hetz 2004; World Bank 2008). The Minerals Law of Mongolia, enacted in 1997 and amended in 2006, defines three types of mineral deposits – strategic, common and conventional – and the means by which the deposits may be exploited. Subsequent amendments to the Minerals Law, which were intended to boost foreign investment in the sector, failed to pass in 2007 and 2008 (GOM Constitution 1992; GOM Minerals Law 2006; USDOS 2009). The Law on the Prohibition of Minerals Exploration in Water Basins and Forested Areas of 2009 seeks to limit environmental damage caused primarily by placer gold mining in and around forests and watersheds (US Embassy 2010). The Windfall Profits Tax Law of 2006 imposed a 68% tax on the profits from gold and copper mining respectively, but was recently amended, and the Windfall Profits Tax will officially end for all copper concentrate and gold products in 2011 (US Embassy 2010). Exploration and mining without a license are prohibited in Mongolia. The Mineral Resources and Petroleum Authority may grant the appropriate license to applicants. However, local governors and representative assemblies may veto an approval. License-holders must pay fees and royalties to both the central and local administrative bodies, and extensive regulations must be followed, including an environmental protection plan. Licenses are transferable, subject to a few limitations (GOM Minerals Law 2006). License-holders are required to prepare an environmental impact assessment and an environmental protection plan, which need to be updated annually to ensure that pollution caused by the exploration activities does not exceed maximum limits. Licenses are inheritable, but cannot be subdivided. All licensees are subject to conditions set out in the Minerals Law, and all licenses must be registered by the Mineral Resources and Petroleum Authority (GOM Minerals Law 2006; World Bank 2003). Landowners or land-possessors may use common minerals from their land for private and noncommercial purposes. Such minerals include gravel, mixed sand and gravel, mud, black soil, and limestone (GOM Minerals Law 2006; MNMA 2008). The government may establish a “reserve area” or a “special purpose territory,” either of which may affect the mineral rights of a licensee. A reserve area is an area previously under license, which a competent authority takes under state control, thereby suspending any reconnaissance, exploration or mining activities. A licensee determined to be within a reserve area is not guaranteed compensation. A special purpose territory is land taken by an authorized government entity for special public needs. Exploration and mining are either restricted or prohibited in special purpose territories. Compensation must be given to a licensee for a taking of special purpose territory (GOM Minerals Law 2006). Conflicts and concerns related to the mining sector include the large number of licenses issued, the use of outmoded and environmentally destructive gold mining technology, inadequate environmental impact assessments, failure to rehabilitate mining sites, inadequate monitoring and enforcement of environmental regulations, water pollution, diminished surface waters, and destruction of pasturelands (CHRD 2006). Artisanal mining has become a social safety net for many Mongolians. The informal small-scale placer gold- mining industry has grown to include an estimated 30,000 people. Artisanal mining practices are often unregulated and responsible for environmental degradation. Conflicts with companies engaged in licensed placer gold mining are on the rise (World Bank 2008; World Bank 2006a; UNICEF 2009). The Mineral Resources and Petroleum Authority of Mongolia is the autonomous agency that implements the Minerals Law. The Geological and Mining Inspection Agency, a division of the State Specialized Inspection Agency, regulates the mining industry. The government agencies overseeing mining lack the capacity and coordination to process license requests in a timely manner and to enforce mining regulations consistently. Communities impacted by mining activities receive little to no compensation (Tse 2009; World Bank 2008; World Bank 2006a). The GOM has shifted from being the predominant owner and operator of mines to being a manager and regulator. The shift in government roles has been accompanied by the establishment of environmental protection and impact assessment laws governing the mining industry. As part of the 2006 amendments to the Minerals Law, the GOM created a holding company, Erdenes, to acquire stakes in mineral deposit developments (World Bank 2006a; Ruthenberg 2007). USAID does not have substantial investment or involvement in the mining sector. The ADB, the World Bank, and EBRD are involved in enhancing Mongolia’s capacity to develop the country’s mineral deposits. The World Bank is also involved in measuring the environmental and social impacts of mining in Mongolia (Ruthenberg 2007; World Bank 2006).